Cabinets suitable for MAME projects are now in stock. 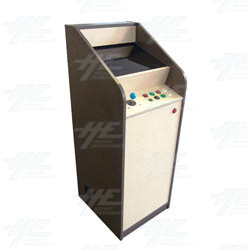 The MAME Arcade Cabinet is a self assembled cabinet that has been designed primarily for use as a MAME cabinet. It is very easy to assemble, and is designed to house a complete PC. The cabinet is simple to put together, with the components easily fitting together and secured with screws. It features a tinted perspex screen, one player control panel, holes in the back of the cabinet for additional buttons, and power cable holes. All of the woodworking has been done for you, and building a MAME machine has never been easier. For more information about the product Click Here or contact one of our sales staff.